Oh, I love these three day weekends! They really do recharge me, 2 days is just not enough in my humble opinion! I slept really great and woke up to a nice sunny day, who would have thought that? I mean, after all, I do live in the Sun City! I had my yoghurt and we were off to walk the doggies. My Parents called me last night, they thought I had sounded sad after I told them about the baby's position and wanted to make sure I was ok. To cheer me up, we decided on having a Sunday morning breakfast. We tend to have lots of those! They wanted Golden Corral, but I thought Hubby would say it was too much food so I just invited them over for some french toast. 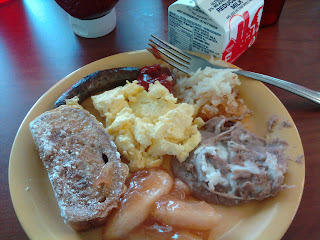 I was shocked when Hubby actually wanted to go to Golden Corral, but it was because he went running this morning. I am so envious of him right now! He gets to run, while uncoordinated me gets to sit home and not go running. I didn't realize I was going to miss it that much! God willing, there will come a day when I will once again lace up my sneakers and head out that door. I can't wait! Off to Golden Corral we went! I don't think I overate that much, I think buffet's make a fortune off me. I probably still had more calories than I actually needed. I also had some bites of everyone's different desserts, but as far as I'm concerned, those bites never took place. Never, I tell ya! The rest of the day was mainly errands and chores, I know, not the most glamorous or relaxing weekend but I guess we have to get some things done. There's laundry to do, doggy room's to clean and CDs to alphebatize. I feel so embarrased, after almost two years of moving into our home, we finally bought the shelves to store our CDs. We had packed them in order, but the box fell during the move and we've been dreading having to put them back in order. Progress was made, but we only got up to letter K. At least we got one box out of the way, I'll take that as a semi victory! I didn't have much of an appetite, but I was a little hungry and knew dinner was going to take couple of hours so I had some watermelon and a handful of pecans for some protein. Our fridge is full of fruit this week, my parents got us some watermelon and canteloupe. 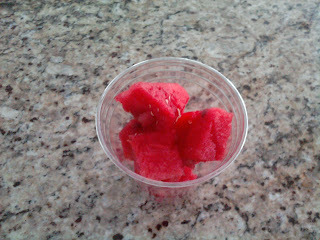 I made some watermelon water too, with my Dad's suggestion of adding vanilla. 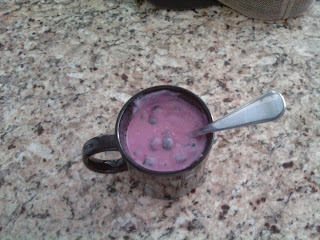 It was really good and refreshing on this hot summer day! We bought this AWESOME barbecue sauce at the farmer's market last month, and went back last week to get some more. 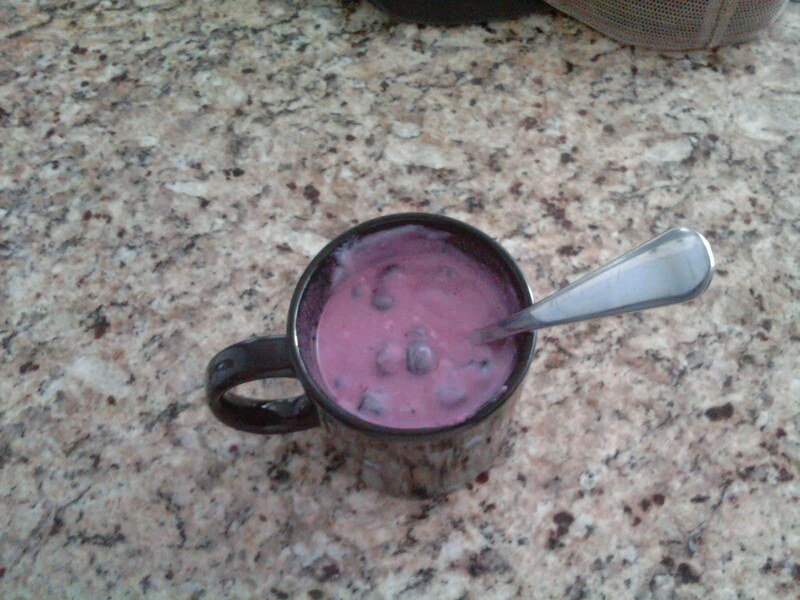 It is SO good!!! We decided to make some barbecue chicken and I experimented with my convection oven today. I tried the MAXI BROIL setting, put some chicken thights in a casserole dish and popped it in there. The oven has one of these meat probes, so I set it to ring at 150 degrees, then added the barbecue sauce and popped it back in until it got to 170. It was so good!!! I paired it with some homemade mashed potatoes, gravy and asparagus. 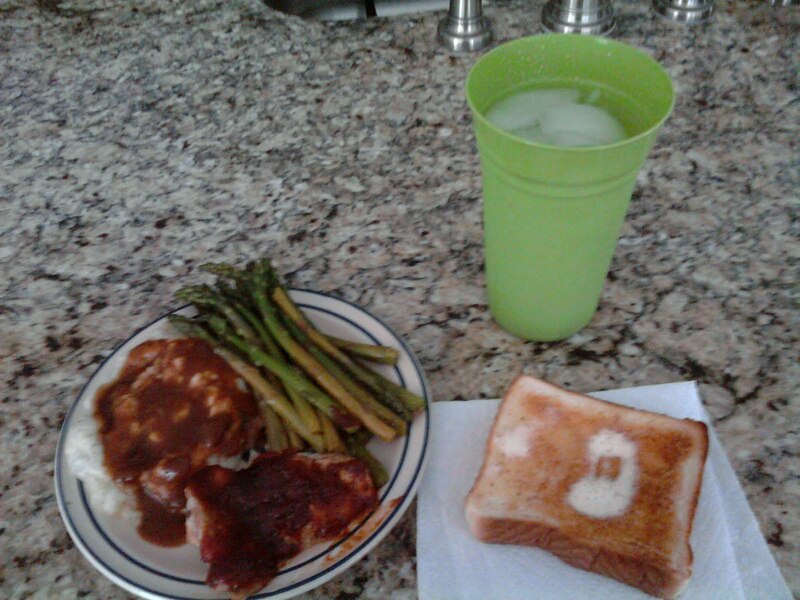 We had already bought the Texas toast in preparations for the morning, so that went with the meal perfectly! 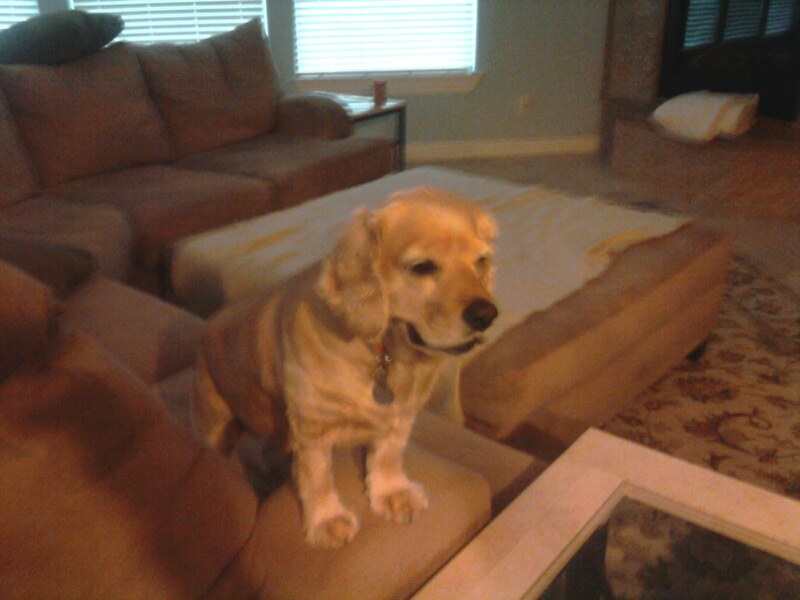 Here's Dulci trying to figure out what that scent is! For dessert, I had to have me some fruit! 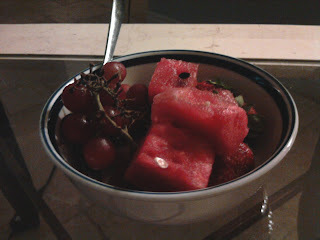 The strawberries, grapes and watermelon were so sweet and tasty! We ended the day with some "Freaks and Geeks." This show is hilarious and I was SO sad when it was cancelled after only one season. They're finally re-airing them on TV and I'm just giddy with joy. I was a senior at Texas A&M when I last saw these shows and it's hard to believe how much has changed in 10 years! However, one thing that hasn't changed, is how much this show ROCKED! I'm a reading loser :( On a random note, the book that was featured on Freaks & Geeks this episode was a really good one, Crime and Punishment. It's one of those books that makes you really think about what Forgiveness really means!